gifted actors, the play makes the twists and turns of an old legal drama completely absorbing. The drama focuses on the effects of the trial and its aftermath on the two central figures—Norma McCorvey the plaintiff, and Sarah Weddington, the lawyer who took her case to court. Most of us in the audience already knew the story—how Norma wanted an abortion to end her third pregnancy, and how Sarah wanted a case that would force changes in the restrictive Texas abortion law. Perhaps we didn’t all remember that Norma never did get that abortion because the case dragged on so long. The baby was born and given up for adoption before the court reached a decision. Sarah, however, did set in motion the legal changes that would change the landscape of women’s rights in America. abortion often offered the only release from an endless series of pregnancies and births for married women, many of them from families that were ill-equipped to support another child. And most women who sought abortions were married. Even today, when contraception is much more available, cheap and foolproof, the majority of women who seek abortions, according to figures from the Guttmacher Institute, are married women who already have at least one child. Those of us who lived through the 1970s and were aware of the Roe v Wade case assumed that it would put an end to all the arguments and restrictions on abortion. Most countries in the developed world have accepted the fact that many women will want to abort a pregnancy that occurs at a time when they cannot bear and take care of another child. People who are strongly opposed to abortion usually claim that a “soul” enters a fetus’s cells sometime soon after conception. They therefore claim that the fetus is a person whose life must be preserved. Many other people dispute this claim. For centuries people believed that a human being becomes human when it is born and most people believe that now. The dispute about when human life begins cannot be solved by science because it is a religious argument. Why is it that the United States is one of the very few countries where large numbers of people insist that their religious views become the law of the land? Perhaps if more people could see the play Roe they might develop a greater understanding of the arguments on both sides of the question. And perhaps more people would be content to let women control their own bodies. Medical science has given women the means to have safe and effective abortions; the decision about whether or not to have one should be left in the hands of the individual, not determined by the votes of outsiders. The Supreme Court’s decision in the Hobby Lobby case has started a lot of people thinking about how access to contraception has changed women’s lives. The Hobby Lobby decision allows some companies to refuse to pay for all forms of contraceptive care for their employees. If all of the owners of a “closely held corporation” declare that they do not approve of some forms of contraception on religious grounds, then they don’t have to pay for insurance coverage for contraception. The talk about this decision and how it may affect healthcare for all Americans has started a lot of people thinking about the struggle to get any form of contraception approved. When Margaret Sanger (1879-1966) started working as a nurse in New York City, she saw a number of women who were suffering from their inability to keep from becoming pregnant over and over again. Doctors were not allowed to tell women how to avoid unwanted pregnancies; so many families were doomed to poverty and poor health because they could not afford large families. With contraceptives declared illegal and therefore unavailable to any except the wealthy, many poorer women resorted to abortionists or tried to abort a fetus themselves. When Margaret Sanger, who had seen her own mother die at 48 worn out by twelve pregnancies and weakened by tuberculosis, realized how many women were sacrificed because of their inability to control births, she determined to devote her life to changing the law. By starting a newsletter, lecturing, and then opening the first birth control clinic in America, Sanger tried to introduce contraception to women. Both she and her sister were arrested at their Brooklyn clinic and charged with distributing obscene literature—information about birth control. Margaret Sanger served a short jail term for the crime, but she received a great deal of publicity and the issue was brought before the public. It is hard today to remember how the lack of birth control affected women’s lives during the years when it was forbidden. Employers discriminated against married women, refusing to hire them because they might become pregnant at any time. Graduate schools refused to admit married women students with the excuse that their education was wasted because an unplanned pregnancy could derail a degree at any time. 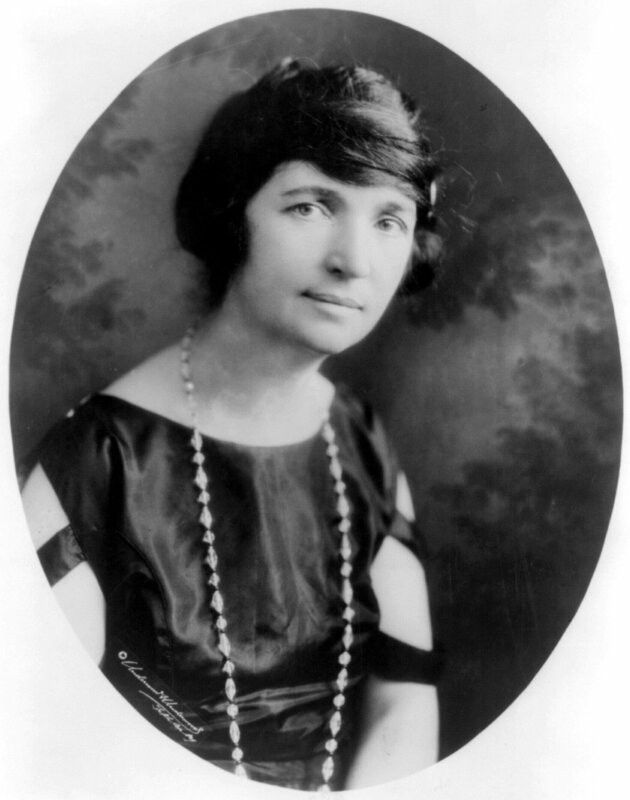 Margaret Sanger fought for many years to make contraception available in the United States. It was a long struggle. By 1965 when the Supreme Court finally decided in the case of Griswold v. Connecticut that contraception should be available, Sanger was 85 years old. A year later she died. Some of Margaret Sanger’s legacy was unfortunate. She believed in eugenics and favored larger families for well-educated, middle class families. The poor and especially nonwhite people, she believed, should strictly limit their family size. Many of the statements she made during her later years were repugnant, and they have been seized upon by conservative politicians to blacken her reputation. But the major battle she fought—to enable women to have some control over their bodies and the size of their families—was an important one. Much of the freedom enjoyed by women today has come about because of the struggle of Margaret Sanger and her associates. Today, on the Fourth of July, when we celebrate the legacy of our Founding Fathers—a legacy deeply tarnished by the racism and prejudices of their ideas—is surely a good time to assert again that we can celebrate the achievements of many individuals despite their flaws and mistakes. None of our heroes or heroines were perfect, but we can accept the good that they did at the same time that we cast aside the bad. The Supreme Court is much like our individual heroes. Some of their decisions have contributed decisively to Americans’ welfare and freedom; others have needed to be modified as time revealed their flaws. As for the Hobby Lobby decision, it seems quite likely that the best that can come from it may be the movement toward having single payer healthcare in the United States so that the health and happiness of Americans depend on themselves, through their elected government, and they are freed from the idiosyncratic and sometimes irrational beliefs of their employers.